Halloween and Fall Festivals are just one of the fun things about Fall. Although it is still in the 80s here in Georgia, I’m still getting excited for Trick-or-Treating as are my kids! 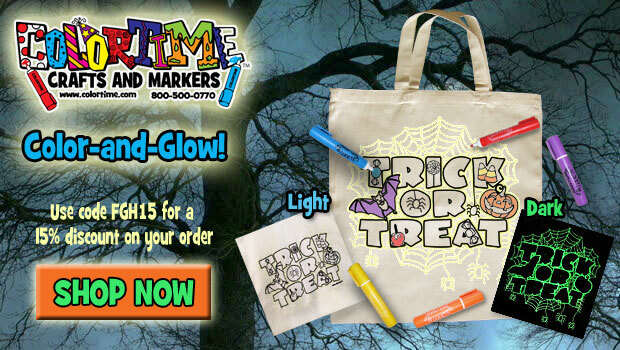 ColorTime sent me this cool “Color-and-Glow” tote bag to try. I love anything crafty so I was excited to put my coloring skills to the test. The sample set came with 3 markers (sold separately on their website here) in orange, green, and purple. Having only those 3 colors forced me to get creative when decorating my bag, but I love a good challenge! Here’s the tote out of the box. I was very pleased with the fabric markers! They offer bright colors and a fine tip, perfect for small details. The tips endured the project very well without much damage so I expect the tips to last through plenty of projects. The tips do not drip paint either so I was able to apply light pressure for shading the bat’s body and the candy corn. The instructions were easy to follow as well. These totes are thick enough so you only need a paper towel between the layers to prevent bleeding. The markers bled very little. The tote is made of thick canvas and has nice handles. The design is adorable and has a web of glow-in-the-dark ink behind it for a fun touch. This bag would be perfect for trick-or-treating or even carrying projects for school or work during your Fall fun! Use coupon code FGH15 for 15% off your order! You can print the coupon here then click below to shop now! Thanks to ColorTime.com for sending me this tote and marker set to try! This set was provided in exchange for my honest review. Keyboarding for the whole family!